Pay-TV giant DirecTV will adopt Ultra-HDTV, which is the next generation follow-on technology from todays HDTV. In much the same way as for most of the current space launch vehicle, the Titan launch vehicle started life as a military missile. Intended as a back up for the Atlas ISBM missile, development was started in October 1955 when the Martin Company (which in 1995 merged with Lockheed to become Lockheed Martin) was awarded a contract for the airframe design. Towards the end of its military operational life, some of the missiles were refurbished as space launchers. Also, the missile formed the basis of a family of space launch vehicles. The market for M2M solutions is constantly evolving, with many factors making significant impact on enterprises that are considering the development and implementation of a new M2M solution. Market demand for M2M is moving from a purely high-end product focus, such as cars, excavators and smart meters, to virtually any type of product, such as food containers, personal navigation devices (PNDs), pets and even Barbie dolls. At first glance, why would an established, or entrepreneurial, state-of-the-art space or satellite business choose to base itself on a small island in the middle of the Irish Sea, some 30 miles off the UK mainland? With a population of around 84,000, boasting the worlds oldest continuous Parliament stretching back well over 1,033 years, the Isle of Man might seem an unlikely location for such a forward looking industry. However, with all due consideration to the past and long standing political and economic stability, its to the futureor more specifically, the skies abovewhere a growing portion of the islands versatile economy is now firmly focused. Insight: Two Dimensional GPS Solutions For A Three Dimensional World, By Patrick Bertagna, CEO, Founder + Chairman, GTX Corp. The Global Positioning SystemGPSis a worldwide radio-navigation system that is formed by a constellation of 24 satellites that communicate with their respective ground stations. The Global Positioning System is mainly funded and controlled by the U.S. Department of Defense (DoD). The system was initially designed for the U.S. military. 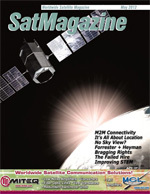 However, over the past 10 years, there has been a widespread introduction of innovative ways to introduce the GPS technology into the private sector; in fact, so many that other countries are now deploying their own none-military use GPS systems in order to fill the increasing global demand for location information on people and products. An Australian satellite communications company was among the finalists in this years World Teleport Awards for Excellence, proving Australia is certainly one of the regions of the world at the forefront of space technology and able to provide some of the Earths best satellite communications. The Satellite 2012 event in Washington, DC, this year drew more than 11,000 satellite communications professionals from 70 countries. The main purpose was to learn, discuss and share the latest developments within various markets that included government, enterprise, broadcast, mobility and telecommunications. Australia was well represented at the event, thanks to its teleports and satellite innovation that proved Australian satellite communications are among the worlds best offerings. If youre underground or in some other closed facility location that lacks a view of the sky, communication with the up-top world can sometimes be difficult or even downright impossible. A new communication solution to deal with these conditions has been created by Gilat Satcom. This solution allows users of Iridium satphones to communicate with those above ground and outside the closed facilities without having to leave their surroundings. This is a light weight, easy-to-install, and cost-effective solution for obtaining sky view when such is not available.